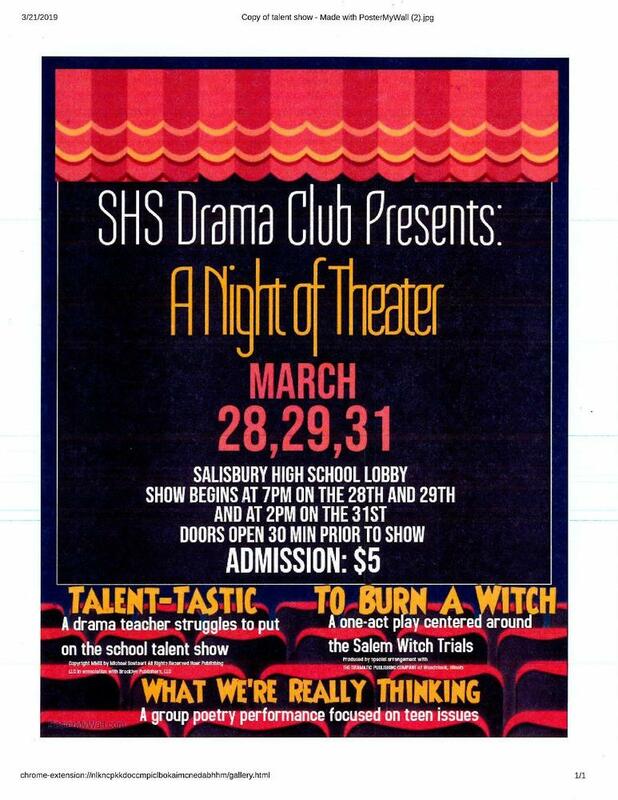 Please join the Salisbury High School Drama Club on this Thursday, Friday, and Sunday for their performances in three short plays. The first one act play, “Talent-Tastic” by Michael Soetaert, features an overworked, stressed out theater teacher by the name of Miss Hooper. As Miss Hooper struggles to put on the school talent show, the principal, Mr. Harmon, threatens to fire her if the show does not go well. After he decides to judge the show, the talent show kicks off with one mishap after another. Will Miss Hooper get fired? Who will win the $1,000 cash prize? From animal trainers to knife throwers, this show is full of wacky characters and is sure to make any audience laugh. The second show is a readers theater performance that is compiled and co-directed by the performers. “What We’re Really Thinking” features the poetic works of various authors including an SHS student. These five students performed their piece at the NEMSHSAA District Speech, Debate, and Theater Tournament at Mexico High School on March 1st and received 6th place. They are eager to show their work to the community. The final performance is a chilling one act drama titled, “To Burn A Witch” by James L. Bray, takes place in 1683 in Salem, Massachusetts. As Ruth Hannah Smith and Mary Abigail Gentry are indicted for being witches, they must decide if they will plea innocent or guilty. Threatened with being burned at the stake by Dame Stanley and Widow Jones, they must decide to trust in God and tell the truth, or lie to save themselves. This group also performed at the district tournament and received 4th place. The plays will take place this Thursday, March 28th and Friday, March 29th at 7pm. The final show will take place this Sunday, March 31st at 2pm. Doors open thirty minutes prior to showtime. Tickets are $5.00 at the door. Please come support our talented students and see the variety of dramatic skills they’ve been working on this semester!